The pipes in our sons apartment burst and 4 families were displaced in the quad plex. He’s living in a extended stay in the next city over for 6 weeks. Our oldest daughter was hired as a branch manager to a new energy company that will compete with PG&E. Dan and Rikki are still working on their new life in Texas. I’m taking care of my husband the best I can and him me. I was reunited with co workers, friends of many years through my long time bestie of 30 years. We’re all meeting up on the 6th with our husbands included. We’re all original couples, too. We all met and began working together, yep, 30 years ago. I worked for Eppies between 1987 and 1996. I started as an 18 year old hostess, and advanced to lead serve. I departed as an assistant manager. I’ll always believe that playing softball for Sacramento for so many years prior afforded me the ability to work on my feet for so many years. These would lead to me being able to stay out of a wheel chair permanently in the years to come. In 2 months I’ll be back in my kiddie pool in an effort to continue to remain out of one. Tomorrow will be a month since I injured my ankle. My CRPS foot. It’s taken a month but I’m healing myself again without medical care. Last time was without too, so was having the flu. I didn’t lay up with the injury, I did take breaks. I used topical reliever, wrapped it in Epsom salts moistened with a dab of water. The worse was the pull behind my knee, back of my leg. Ibuprofen. I haven’t been able to wear shoes again yet, other than slippers and my open back orthotic sandals, and that’s okay for now. Awesome things are happening for Stronger Than Pain. It can take years sometimes and that’s okay, too. Lectures and presentations have already been given, offline. There’s just one more thing. We represent suicide prevention, mental health. I won’t be bullied in any capacity. Not as a disabled person and not as an abled one. If I allowed myself to be, I wouldn’t be a very good advocate for those who are used, abused and taken advantage of. Example. A little girl wears a custom made barrette in her hair to school. Someone else wants it and takes it and let’s everyone else believe it was theirs. If it’s not yours, you’re not entitled to it. Ever. But I still have my balls. 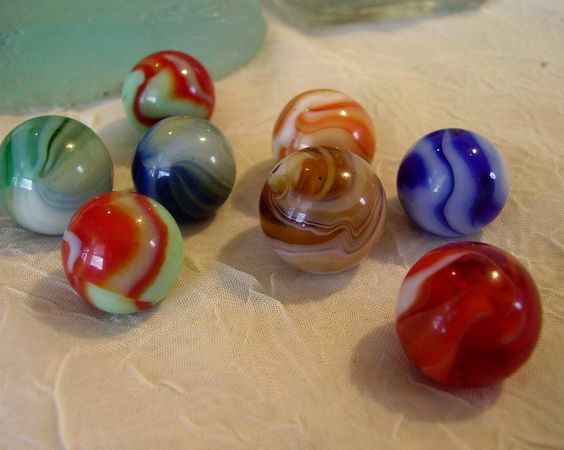 I use marbles for therapy. I’ve misplaced them. I still have the tennis balls close by. I use the marbles the most for my hands. It really is amazing what we can use for pain relief that might seem a bit silly to some. I use them in different ways for hands, feet and body. To roll out knots, reduce inflammation, promote blood flow and better internal organ function. The tennis ball techniques I learned while receiving MLT. The marbles was some months back off the top of my head during a hand flare. Imagine what we can do with a spatula. Hilarious! Our oldest daughter Kharisma and our grandson De’Mantai will be on a Greyhound soon, destination Texas to spend time with our daughter Rikki who moved there in November. From there Rikki is driving them to my parents in Georgia as previously planned. We learned 2 days ago that my dad has 4 blood clots in one leg and 3 in the other. These are unrelated to his stage 4 cancer. He’s an active man, but he’s to be on bed rest now with the blood thinners and depression is already.present as a result. My wish is that their grandkids arriving in a week or so brings them all comfort. Today is a significant anniversary to something I won’t mention this time. This year there won’t be any grief over it. It had taken awhile to let that one go. It’s been gone as it was for so long a year today. The 26th will be the anniversary to the injury that led to CRPS 17 years ago. Ridding myself of most of that too. It’s like a bug you can’t flick off. 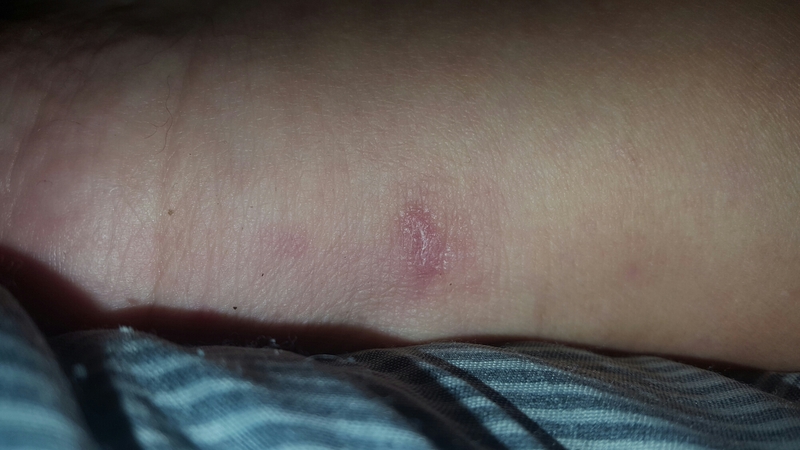 The bruising is fading from the dog bite on new years eve and the bites themselves are doing well. His are a little slower healing. I mixed lavender with OTC lidocaine, and fresh steeped Turmeric for topical relief. Well I’m off to play with my balls, check in with mom, steep another batch of my medicinal tea concoction, do a few Spanish lessons and burn some white sage which I’ve done each day since starting. It really has helped restore balance and life force, but I suppose it wouldn’t if.I didn’t believe in it. Oh where oh where have my marbles gone. Happy 2nd week of 2018. Our new years day and evening was pleasant. He worked that morning and.our son was coming to get me for Church as arranged. I was up at 8:00 a.m. and ready for his arrival. I called him before he reached me to tell him I couldn’t go after all. My dogs were in a mood and and even though I had already separated them in order to leave, as soon as I closed the door behind me and stepped outside the gate to meet Ozra they started howling like wolves, loudly. I could hear them from the driveway. I had an uneasy feeling. My husband got home from work early afternoon. I had done chores, my physical routines, and got everything ready to cook the next day. We played Words, listened to music and I was inclined to reactivate Facebook to wish everyone a happy New Year, share some progress and family. The dog fight. I mean that literally. We both jumped up, he grabbed 2 of them, and was bit pretty badly in 3 fingers and his thumb. I grabbed the other 2 that suddenly wanted to fight as well and was bit pretty good with both a gash and puncture in my left lower thumb. 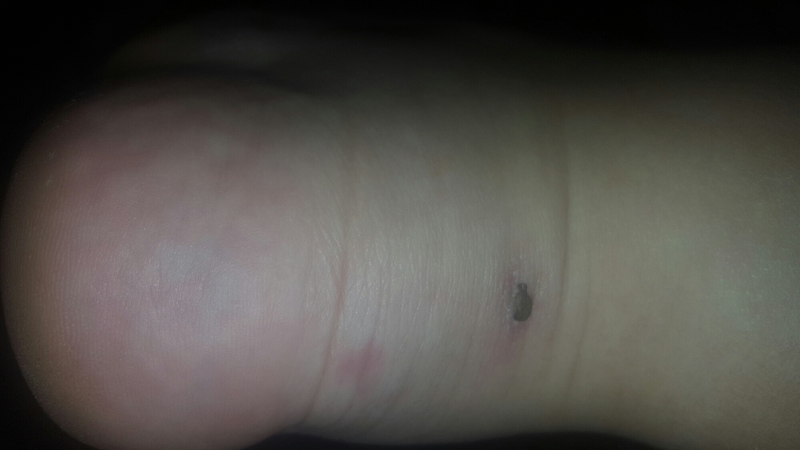 The puncture hit the bone and swelled through to the palm of my hand. Now I had 2 near worthless hands, he had one good one. As we’re both securing our own mass bleeding my mind goes straight to I don’t care about CRPS. Don’t care about if a flare starts, not worried about a spread. If I cared that much I would have reminded myself before I intervened, I have CRPS you can’t get involved in a dog fight and don’t help him either. I might think a lot of things, but I don’t think like that. Regardless of the situation, I had planned to cook a Turkey and it still needed to get done. I needed to get creative in order to achieve my goal and throw any pain or thoughts of it away that could otherwise halt or alter new years day. At 3:30 p.m yesterday the bird came out of the oven and dinner was still a success. He left for work nearly 2 hours ago swollen, punctured and gashed. He works in fulfillment, he uses his hands and feet all day. I’m not sure how he’ll manage the shift but I have faith in him that even in pain he will. The only part I got upset at but held back on repeating was that I told him immediately to wash his hands. He didn’t. Today his hand shows signs of infection. Today too I did mention again that I told him to care for it and he said he did. Yeah once the next day. To be clear, I’m speaking of wound washing. Before work he went to buy peroxide, triple antibiotic ointment and bandages. We want help, advice, want our injuries and pain acknowledged, yet won’t consider enough any that’s given until it’s too late to reduce further damage, complications or pain. I’m glad it happened on the eve. It went bye bye at midnight and yesterday was good even though my perception or mindset could have been all bad. It’s hard to believe it’s only been a year. This time last year I was getting ready to go to Tennessee for my second set of treatments for MLT. I had stayed 2 weeks. In addition to medication management and SCS, I generally had a lumbar sympathetic pain block each year for 16 years. Last year it was replaced by MLT this year it’ll have to be me for me. Finally getting over the flu. I had the flu shot in November, but the lady at the pharmacy said many different strains are out and about. Resumed my normal routines 2 days ago. During the worse of it, I still did some daily, not all. I don’t think I would have ended up in a flare. I am thankful that a couple of flares a years whether or not accompanied by a depressive episode is so much better than the constistant several, long in duration, and painful ones that came with too many years. Playing a lot of Words with Friends (scrabble) mostly with my husband which is a good thing. For me it helps my mind recall words, be with him differently, and have fun at the same time. I’m blogging via my Kindle until my laptop is functional again. Hand and finger therapy. Stronger Than Pain INC is moving along and we look forward to 2018. Today is laundry, espresso, words and music. Back to Church in the morning. And Happy New New Year. I asked him to bring his hoodie and if he was ready to camp. He said yes Nana. I said do you understand what that means?, He said yes Nana. We’re going to snuggle up and drink hot chocolate and camp out. While this won’t be in a tent outside it will be a little similar. I’ve been working this morning to get it ready for us. While I’m not certain yet, I may even simulate a camp fire with firewood in the smaller BBQ in order to toast marshmallows and sit around a fire for a few. I can’t wait to share our fun and make new memories. My aspirations are much simpler now. They include living each day however I might in a different mindset that I had previously. If I hadn’t gone through all that I have, especially the last 3 years and definitely since February of 2016 I most likely would still be thinking as I did then and doing as I did then. I most likely wouldn’t have even found a way to go on, yet I have. I might have stayed depressed waiting and wondering why or if ever I would feel okay enough in body again. That’s heavy. Don’t we all feel that way? Or most of us? I use to think that physicians were suppose to help us. I don’t even believe that anymore. I know sometimes people expect me to choose one side or another of something. I don’t choose like that. Perhaps some of it , my lack of forming words or expressing myself correctly enough to others is from abrupt discontinuation of medications so many times, or the TBI’s I’ve had or my Cerebral Palsy is catching up to me a little more, or the mental break downs as a result of unmanageable physical pain. You know brain fried? Or just believing that I’m responsible for me above anyone or anything else. Maybe. Or maybe I do express myself well enough and it’s just perception. Some people can’t wait to be offended. I suppose it’s easy enough to just ask for clarification, but the human emotion rather feel slighted so they have something to fight for or against. I didn’t even use to be a TV person. Not like I am now. I enjoy watching a Series. I had pretty much given up writing, 100’s of poems and lyrics over the years. I couldn’t squeeze in joy for myself. I’ve taken up painting. I can’t stroke right, or brush evenly, I don’t have enough feeling in my thumb, forefinger, and my middle of finger of that same hand locks from curving. I can barely feel one side of that arm up to my elbow. I still use that hand. I’m ambidextrous which has helped me greatly. I enjoy making my husbands food even if it takes me all day. A couple of days ago I was cutting an onion and sliced the palm of my left hand. On Thanksgiving it did the same thing to tip of my finger. I have choices. Stop using these hands to prevent accidents or keep using them. I need to use them. My legs ache often, my CRPS type 2 is so so right now only because of the colder weather but I move my legs everyday, ankle raises, knee raises, back movement, arms. I don’t have full body CRPS, I do have full body various other diagnosis’ including both my lumbar and cervical spine. If I didn’t stretch, my flesh would constrict against my bones and my pain would be escalated. I was barely 33 when my life stopped as a result of CRPS. Or is that I let my life stop because of it. I’m still thinking about that. I’m a caregiver to my husband who also isn’t well. My son is a caregiver to me as needed. He was at the hospital for me, us, during his dads last heart attack last month. He advocated for us with physicians, he stayed in front of me so I could drive the car home from the ER parking hot safely as his dad was being transported from the first hospital to another. I’m in the process of becoming a member at the Church our son was baptized at years ago. I’m a baptized Lutheran. My goal is to be baptized again by submersion as a local yet Southern Baptist. I miss attending at times and that’s a set back for me. Or is it still progress? My Narcolepsy is worse against right now but I set the cell alarm to vibrate to wake me or keep me from the dozes. I really am learning to manage my own life. Today I have chicken breasts in the crock pot with a buffalo sauce. It’ll be ready by the time my husband gets home from work tonight about 11:00 p.m.
Not this Saturday but the next we’re going to our local swap meet outside auction, I don’t get out much still relying on someone else to get me anywhere. Over the summer I had myself on a great schedule. Up early, in bed early, but I’ve altered my routines to his schedule. I get a nap each evening between 5:50 and 6:30 p.m. About 7 p.m I make an espresso. I can’t be amidst pain all day long so I’ve minimized my internet time again. Feeling other people too much only sets pain into my own body. Heck, maybe I really shouldn’t be on the internet at all. Anything that can get in the way, will. Ha! I have no working computer again and did try to restore my laptop it didn’t work. My husband tried a few days ago too. Nope. One more option and that is to buy an encasing pull the hard drive, enclose it, and go from there. The one I speak of above hasn’t worked since summer time. I was using my really old back up one, the one that barely did anything because of such an old version of windows but… my dog rushed through the side table, tangled in the cord and to the ground it went before I could catch it from making contact. Actually, I do have a working comp it’s just not mine, but am grateful to use it. Is there even such a thing as bad luck? I’m not even sure about that one anymore. Randomness. I was filling out an application the other night and the entire page went down during it. Maybe that wasn’t meant to be either yet I could change it by doing so again. Nah. My aspiration is to live. My crock pot is my best friend and my home made cafe mocha makes me smile. I wish you smiles today! How many of you consider pain or hardships as blessings? While pain, hardships, disability, or inability are not things we’ve asked for in our lives, they can, if we let them, teach us, help us better when the next crisis comes a long. They also teach us compassion, even if we were already compassionate people. Sometimes compassion comes in the form of understanding someone like us, who shares our illnesses, but what about compassion for those who aren’t us? Those who’s illnesses perhaps are different? I’ve been blessed. So blessed that I know what it is to be homeless and I’m not speaking of homeless in another person’s home. Are you really homeless if someone else puts a roof over your head? You may not have your own home, but someone else has given you theirs, therefore how homeless are you? All those things we take advantage of yet aren’t necessities. Hot water, heat, air. These are not things that cause me stress they can however reduce my ability to progress in pain because it’s take effort that most in pain can’t or won’t achieve. For quite some times there wasn’t any working toilets either. Imagine that. It was easy enough to accomplish, so you potty in something else. I learned so many different ways to feed us, bathe us, heat us and cool us. Mostly these are things our world takes for granted. I consider them being lessons. And I imagine what it was like 200 years ago. Living off the land, cooking with coals, or wood, fetching water from a stream and heating it for those things we needed. And with that, I’ve learned. I know that if our world is ever compromised, or if, can I be funny now? The zombie apocalypse happens, if marshal law is ever enforced, or if it just gets harder and harder in America, I will survive. I’ll survive right along with those who shelter in coves, underground, on the river, in the mountains, on the streets. Will you? It seems that I’m harsh sometimes, I know. The perception of most is that I’m without compassion and that I don’t understand you. On the contrary I do and that is why I won’t go silent about the things that can really help you, save you, assist you. Look, I don’t care about your pain medication or how much you need it, I care about you being able to live without it when that day comes for you. I don’t care about what you have, or how your life is over because of it, I care about how it is possible to live with it, if you want to. Easy for me to say, right? We live in a society that believes that someone else is responsible for our lives, our pain relief, our live or give up. No one is not really. There was a lady who attended the Gohl Method program with me the second time. She’s a nurse. She has CRPS. She was born into a country that the only way to get food was to stand in a line, food controlled by the government, a country that America isn’t, not yet. The lady came here and she thrived in education. Yet we put down all the immigrants because they are somehow less than us. Funny thing is that they are grateful to be able to buy their own food, from their own earnings, they are prouder Americans than most Americans are because they know a different type of suffering. The lady has CRPS, gets her MLT treatment again, and she goes on with her life. We can though, we can’t go on with our lives because we expect healthcare to somehow do the work for us we should be doing ourselves and for ourselves. Facebook isn’t good for me and I’ll leave that down for a bit still. The things I post are taken as offensive and then I get defensive. Facebook is both a save from isolation for some and it causes further isolation for others. I think that twitter, or blogging is better for me. I didn’t run away and even though it may seem as such to some and while I had tried to tell myself I wouldn’t deactivate it again and instead simply not log in, for me, it is my better choice for an optimal break. The same day that I deactivated I attended a training webinar. I’m still a Medtronic Patient Ambassador. Stronger Than Pain INC isn’t mine, I’m only apart of it for my son. My wishes are bigger. They are for life not for inability to live life or stay in it. I don’t believe it’s any physicians job to change my life. They can assist me, but I have to make that difference. Heart disease, diabetes 2, multiple other illnesses that people end up with whether primary or secondary are for us to change. I don’t believe that physicians prescribe opioids just to prescribe them. I’ve been denied for alternative care too. I believe that if addiction, misuse or overdose occurs that we chose to do that to ourselves. If a medicine is prescribed every 8 hours then taking it again 2 hours later is leading to your own destructive behavior. I believe that in part, some documented opioid related overdoses were in fact suicides. While my faith is low for western medicine it’s not because of a push for or lack of prescribing opioid analgesics. Musculoskeletal disorders (MSDs) are injuries or pain in the human musculoskeletal system, including the joints, ligaments, muscles, nerves, tendons, and structures that support limbs, neck and back. But after a really hard decline, clearing my body of all medications, stretching, working on my mindset, I’ve been able to halt progression of those problems. My pain relief can be found in your food section of a grocery store. I had turned my SCS off upon my first treatment of MLT in late October of 2016. It remained off during my second 5 days of treatment in mid January of 2017. I was able to keep it off for quite sometime after. It’s been back on for a few months now. This isn’t a negative but a positive in that my SCS affords me my own continuity of care without drugs prescribed or otherwise. Have you ever been blessed by your pain or hardships? I have and I’ll teach you from each of them. Even if you can’t stand it. Nor should they have to.